This is how the order of the German House was established. 1. In the name of the Holy Trinity we inform all who now are or who are to come by whom, when and how the order of the Hospital of St. Mary of the German House of Jerusalem was established. 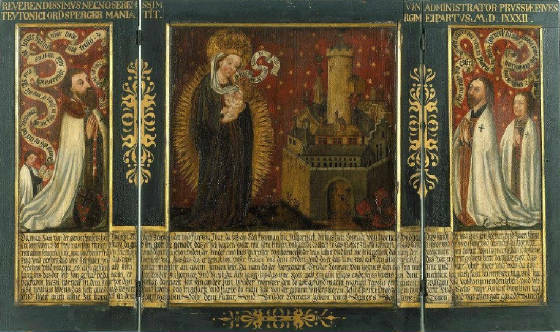 In the year eleven hundred and ninety from the birth of our Lord, at the time when Acre was being besieged by the Christians and, with God's help, was won back again from the hands of the infidels, at that very time there was in the army a band of good people from Bremen and from Lübeck, who, through the charity of our Lord, took pity on the manifold needs of the sick in the army and started the aforementioned hospital under a sail of a ship, called "a cog," under which they brought the sick with great devotion and cared for them with zeal. This small beginning moved the hearts of Duke Frederick of Swabia and other noble lords, whose names are written hereafter: the honorable Patriarch of Jerusalem and Henry, King of the same realm, and Duke Henry of Brabant, who was head of the army there, and the Master of the Hospital of St. John and the Master of the Temple, the archbishop and the great men of the same realm, by whose counsel, the aforementioned Duke of Swabia sent his messengers overseas to his brother King Henry, who was the Holy Emperor, to get the Pope, Celestine, to confirm the aforesaid hospital and grant to the sick the rule of the Hospital of St. John and to the knights, the order of the Templars. It thus came about that both these ways of life and their liberties, by the grace of our Lord and by the liberality of the Pope, were confirmed and given to the hospital. Yet this way of life itself is granted not just by men on earth, but it is likewise granted by God in heaven. 2. We read in the Old Testament that Lord Abraham, the great patriarch, fought to free his brother, Lord Lot, who had been made prisoner, and by battle from delivered him from prison. On his return Melchizedek, with gifts, met him, and there the Holy Ghost revealed how dearly he who had the highest Place in the Church should regard the knights and how he should receive them with blessings into the protection of the Church with particular favor, and also furnish them with indulgences and confirmations of the religious endowments offered them by righteous folk. Thus arose the knightly order of the faithful to fight the infidels. 3. This order, signifying both the heavenly and the earthly knighthood, is the foremost for it has promised to avenge the dishonoring of God and His Cross and to fight so that the Holy Land, which the infidels subjected to their rule, shall belong to the Christians. St. John also saw a new knighthood coming down out of heaven. This vision signifies to us that the Church now shall have knights sworn to drive out the enemies of the Church by force. In addition to this there is further testimony that in the time of Moses and Joshua, who were judges among the Jews, there were knights of God who fought the fights which were pleasing to God, and who, like lions, subdued the evil and heathen peoples, who had seized the Holy Land, and exterminated them to the last man. Lord David was a king whom God Himself chose for the kingdom, and also a great prophet; he had men amongst his household whose duty was that they alone should be his body-guard and destroy all those who lay in wait for David. This was a sign that Our Lord God, who is Head of the Church, shall now in these latter days likewise have guards. We remember also the struggle, praiseworthy and pleasing to God, of the knights who were called the Maccabees; how stoutly, for their honor and their faith they fought with the pagans who wished to force them to deny God, and, with His help, defeated and exterminated them so that they cleansed once again the Holy City which the pagans had defiled, and restored once again peace in the land. 4. 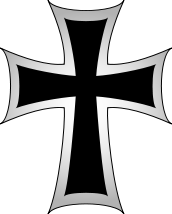 These struggles, this holy Knightly Order of the Hospital of Saint Mary of the German House has zealously imitated and has deserved to be graced with many honorable members, for there are knights and chosen fighters, who for love of honor and the fatherland have exterminated the enemies of the faith with a strong hand. They also, from abundance of love, receive visitors and pilgrims and the poor. They also from tender-heartedness, serve with fervor the sick who lie in the hospital. 5. Amongst the members are also priests who play a worthy and useful role, for in time of peace they shine in the midst of the lay brethren, urge them to observe strictly the rules, celebrate for them divine service, and administer to them the sacraments. But, when hostilities break out, they are to strengthen the brethren for battle and admonish them to remember how God also suffered death for them on the Cross. They are likewise to care for and protect both the healthy and the sick, and are to carry out all their duties in a gentle spirit. Therefore many popes have looked upon this special order, which has spread widely to the profit of Holy Church, with joyful eyes and have illumined and endowed it with many liberties and privileges. This is the rule of the brethren who serve the German House of Saint Mary. To the praise of the almighty Trinity. Here begins the rule of the brethren of the Hospital of Saint Mary of the German House of Jerusalem, and it is divided into three parts. The first part speaks of chastity, of obedience, and of living without property. The second part speaks of the hospitals, how and where they shall be established. The third part speaks of the rules which the brethren are bound to observe. 1. Of chastity and obedience and living without property, and their ordering. There are three things which are fundamental to every life in religion, and they are prescribed in this rule. The first is perpetual chastity, the second is renunciation of one's own will, that is, obedience unto death, the third is the assumption of poverty, that is living without property after entering this order. These three things fashion and make dedicated men like unto the image of Our Lord Jesus Christ, who was and remained chaste in soul and body, and who assumed great poverty at His birth, when they wrapped Him in ragged swaddling clothes. Poverty followed Him all His life until He hung naked for us on the cross. He has given us also the model of obedience, for He was obedient unto death to His Father. Thus He sanctified in Himself holy obedience when He said: "I am not come to do mine own will, but the will of My Father, Who sent me." Also, St. Luke writes that Jesus, when leaving Jerusalem with Mary and Joseph, was obedient to them. On these three things, chastity, obedience, and living without property, rests completely the strength of this rule and they remain unchangeable so that the master of the order has no power to dispense anyone from these three things, for if one of them is broken, the whole rule is broken. 2. That they may have property, inheritances, land and serfs in common. The brethren, on account of the great expenses, arising from the needs of so many people and hospitals and of the knights and the sick and the poor, may possess, to be held in common in the name of the Order and their chapters, movables and inheritances, land and fields, vineyards, mills, fortresses, villages, parishes, chapels, tithes and such things, as are granted in their privileges. They may also possess in perpetual right, people, men and women, serfs, male and female. 3. Of the liberty to accuse and answer accusations in a lawful manner. 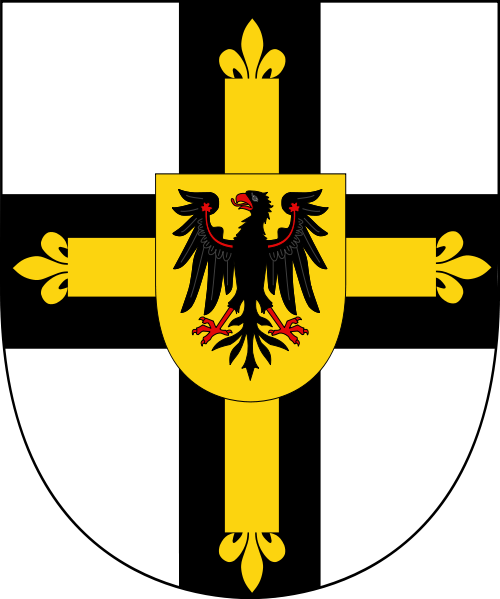 Since every religious order with privileges and liberties from the See of Rome is exempt from secular courts, so it is likewise fitting that this holy Order of the Brethren of the Hospital of Saint Mary of the German House of Jerusalem realize that it is taken under the special protection of the Papal See. But, in order that such protection by the Church be in no way contrary to right, we decree that the brethren in suits which they have against anyone, keep in all ways their liberties and privileges, provided that they not act wickedly, unfairly, and maliciously against those whom they accuse or indict. And if they are accused or indicted they shall not proceed cunningly and deceitfully against their accusers. Because this order had a hospital before it had knights, as appears clearly from its name for it is called the Hospital, so we decree that in the main house, or where the master with the counsel of the chapter decides, there be a hospital at all times, but elsewhere, if someone wishes to give an established hospital with funds to the house, the provincial commander with the counsel of the wisest brethren may accept or refuse. In other houses of this order, where there is no hospital, no hospital shall be established without special command of the master with the counsel of the wiser brethren. 5. How to admit the sick to the hospital. The sick shall be admitted to the hospital in this manner When the sick person arrives, before being put to bed, he shall confess his sins, if he is strong enough and if there is a confessor, and he shall also receive the Eucharist if the confessor advises it. In no other way shall anyone who is sick be admitted to the hospital. And if he has any property the brother in charge of the hospital shall keep it against a written receipt. He shall also warn the sick person that he take great care of the welfare of his soul, and what the sick person orders and decides concerning his property shall be carried out as far as possible. 6. How the sick shall be cared for in the hospital. Then after the sick person has been admitted to the hospital, he shall, at the discretion of the hospitaller, who shall decide what he needs for his illness, be cared for diligently, with such discretion that in the main house, where is the head of the Order, there shall be physicians according to the means of the house and the number of the sick, and the sick shall be compassionately treated and lovingly cared for, according to the judgment of the physicians and the circumstances of the house, and every day they shall in charity be given food before the brethren eat, and on Sundays the Epistles and the Gospel shall be read to them and they shall be asperged with Holy Water and the brethren shall go in procession to them. In other hospitals they shall in charity be fed at the proper times. On Sundays the Epistles and the Gospel shall be read and they shall be asperged with Holy Water, with no procession, unless the provincial commander, at his discretion, orders otherwise. Also we leave to his discretion, with the advice of the wise brethren, provision of physicians in the aforenamed hospitals. Furthermore, careful watch shall be kept, that in all hospitals the sick never lack a night light. Those who die in these hospitals any time in the day before Vespers shall be buried at once, if it suits the warden. Those who die after Vespers shall be kept over night and buried the next day after Prime, unless it is decided otherwise by the warden of the hospital. Also we wish it to be strictly observed that in all places where there is a hospital, the brother to whom the master, or the master's deputy, has entrusted the care of the sick shall care for their souls as well as for their bodies and take pains to serve them humbly and devotedly. The commanders likewise shall be careful lest the sick lack anything in the way of food and other necessaries, so far as they can be provided. However, if through despite or negligence on the part of those who provide for the needs of the sick, the sick are neglected, then the brethren who serve in the hospital shall notify the master or the superior, who shall inflict suitable punishment according to the gravity of the offense. He to whom the sick are entrusted shall also take care to secure, if possible, attendants who will bring devotion and humbleness to the task of compassionately and faithfully serving the sick; and if obvious neglect by those who tend the sick comes to his attention, he shall not let it go unpunished. The commanders and also the other brethren shall bear in mind that, when they first entered this holy order, they solemnly promised to serve the sick as well as to keep the order of knighthood. 7. How alms collectors shall be sent out. Since care of the sick entails great expense, in accordance with concessions in the privileges of the Order, there may be ordained, by special permission of the master or of the provincial commander, and sent out alms collectors for the sick, who are religious and chosen for that purpose, who may announce the papal indulgence to the laity and also remind the people to come to the aid of the hospital with alms. They shall likewise be of such good life that they do not, by their bad example, as the sons of Eli did, turn the people from sacrifice to God and from giving alms for the sick. Likewise, they shall not be immoderate in their expenditures, and, as they travel about the countryside, when they come to a house of the Order, they shall gratefully accept what the brethren in the house offer them and be satisfied, not immoderately demanding more. 8. How they shall come to and hear divine service. The brethren, priest and lay, shall jointly come day and night to divine service and to the hours, and the priests shall sing and read the services according to the breviary and the books which are written for the order; the lay brothers, if present, or wherever they are, shall say for Matins thirteen Pater Nosters, and far the other canonical hours seven Pater Nosters, save for Vespers when they shall say nine. They shall say the same number of Pater Nosters for the Hours of Our Lady, and when the lay brothers are sufficiently literate so that some of them, on their own or with the permission of the superior, wish to recite with the priests the canonical hours or the Hours of Our Lady with the Psalms and the other things pertaining to the priestly office, they are excused from saying the Pater Nosters set for the lay brothers. Brethren who hold office are permitted to be absent from divine service and collation, when the duties of their office do not allow them to attend. At Matins, after the invitatory and the hymn, the brethren shall sit down together, but when the Gospel is read and lauds sung, and during the Hours of Our Lady, the healthy shall stand, and in their oratories, shall rise from their seats, bowing at every Gloria Patri in reverence for the Holy Trinity. But when they shall stand they shall bow at the Gloria Patri with a seemly bend of the body. They shall likewise be diligently on guard lest anyone disturb others by whispering, by talking out loud or by unauthorized prayers, and they shall strive diligently that what they say with their lips shall come from their heart, for prayer is of little avail without the heart's participation. 9. How often in the year the brethren shall receive the Sacrament. Since Our Lord said in the Gospel: "He that eateth My flesh, and drinketh My blood, dwelleth in Me, and I in him," and "he shall not see death," so we decree that all the brethren of this Order take Holy Communion seven times a year. First, on the Thursday before Easter Day, the same Thursday when Our Lord Jesus Christ for the first time instituted the sacrament and gave His body and His blood to His disciples and commanded them to begin to celebrate the office of the Mass in remembrance of Him; the second time on Easter Day; the third time, on Whitsunday; the fourth time at Our Lady's Mass in August; the fifth time at All Saints Mass; the sixth time on Christmas Day; the seventh time on Candlemas Day. It is not proper to receive Holy Communion fewer times, since other orders, where there are likewise lay brothers, are accustomed to partake much more frequently. 10. How prayers shall be offered for the living and the dead. For the dead who already have come to God's judgment and therefore need quicker help, the brethren shall be careful not to delay giving the help which they ought to give. Therefore, we decree that each brother priest who is present say the office of the Dead, as set forth in the breviary of the Order, for each brother of his Order, just deceased, and each lay brother shall recite one hundred Pater Nosters for his convent brother's soul. The brethren in houses where there is no convent shall complete the same number. Each brother shall recite every day fifteen Pater Nosters for all the brethren of this Order wherever they have departed from this world. Furthermore, each brother priest of this Order shall celebrate ten masses annually for the sins and salvation of all brethren and servants, benefactors and friends of the house who are living, and ten masses for the dead. The clerks who are not priests shall recite three Psalms for the living and three for the dead. Each lay brother shall recite thirty Pater Nosters a day at the prescribed hours for the benefactors, servants, and all friends of the Order, still living, and the same number also for the dead. But they are not required to recite these Pater Nosters while fasting. It is the obligation of the house in which a brother dies to give to a poor man the best habit of the deceased brother and, for forty days, the food and drink which is customary for one brother, since alms liberate from death and shorten the punishment of the soul who has departed in grace. No brother shall make any other offerings at any time of the year. 11. How and with what the brethren may clothe themselves, and what they may have for bedding. The brethren of this order are allowed to wear and use linen for undershirts, for drawers and hose, for sheets and for bed covers, and for other things, when suitable. Outer garments shall be of sober hue. The brother knights shall wear white mantles as a sign of knighthood, but their other garments shall not differ from those of the other brethren. We decree that each brother wear a black cross on mantle, cappen and armor surcoats to show outwardly that he is a special member of this Order. Furs, pelisses, and coverlets shall be of no material other than sheep or goat skins, yet goat shall be given to no one, unless he asks for it. The brethren shall have shoes without laces, or buckles, or rings. Likewise, those in charge of clothing or footwear shall take pains to supply the brethren in so religious and seemly a fashion that each one has the right size, not too long, nor too short, nor too tight, nor too wide, and that each one may without any help put on and off his clothes and shoes. As for bedding, let each brother be content with a sleeping bag, a rug, a sheet, a coverlet of linen or buckram and a pillow, unless the one in charge of such articles wishes to give more or less. It is fitting that upon receipt of new things, the old are returned, so that the one to whom the clothes are handed over may distribute them to the servants and to the poor. But should it happen, which God forbid, that a brother outrageously insists on arms or clothing or such things finer or better than those given him, then he deserves to be given worse. For this proves how much he is lacking in the clothing of the heart and in inner virtue, who bothers so much about the outer needs of the body. Since clerics living in the world should show their religion by their clothing, so it is all the more seemly that those in the Order use special clothing. 12. Of the shaving of brother clerks and lay brothers. All the brethren shall have their hair shaved in a regular and clerical manner, so that they can be recognized from the front as well as from the back as religious. As for beard and moustache, likewise care shall be taken that they be neither too short nor too full. The brother clerks shall have a tonsure of not too small size, as is seemly for men in orders, and likewise because they officiate at the Mass they shall shave the beard. 13. How and what the brethren shall eat. When the brethren assemble for meals, the clerics shall recite the customary grace, and the lay brothers a Pater Noster and an Ave Maria, and all shall take the victuals given by the grace of God and by the house. On three days, Sunday, Tuesday, and Thursday, the brethren of this Order are allowed to eat meat; the other three days they may eat cheese and eggs, and on Friday they eat fish; however, they may eat meat every day on which Christmas Day falls, even if it falls on a Friday, because of the joy of the holy season. To all brethren common victuals should be given and distributed equally according to the status, place and need of the brother, yet among the brethren more attention shall be paid to each one's need than to his eminence. For the need of one nothing shall be taken from another, but each shall have a share according to his need. They shall likewise not desire for themselves all they see given in charity to others in need. Let him whose need is smaller thank God; let him whose need is greater, because of weakness, humble himself, and, when he receives more because of weakness, let him not pride himself on being treated with charity; thus may all members live in peace. We warn that special abstinence, which markedly differs from the general, be avoided. In their houses the brethren eat two and two together, except for vegetable dishes, and drink separately. Furthermore, in all houses where there is a convent of brethren, that is, a commander and twelve brethren, to the number of the disciples of Our Lord Jesus Christ, the custom of reading at table shall be observed, and all who are eating shall listen in silence, so that not only the mouth is fed, but also the ears which hunger after the word of God. However, those at table, in case of need, may talk quietly and in few words with those who are serving, or with other people with whom they have to settle some small matter. The servers and those eating at the second table after the convent and the brethren in the small houses where there is no reading shall endeavor to keep silent as far as the business of the house allows, unless the superior, because of visitors, gives permission to speak. The brethren shall not rise from table before they have finished their meal, except when absolutely necessary, after which they may return and finish their meal. When the meal is over, the clerks shall recite the customary prayer and the lay brothers two Pater Nosters and two Ave Maria, and in every house they shall go in an orderly fashion to the church or elsewhere as assigned by the superior. Whole loaves of bread shall be kept, but the rest given in alms. 14. Of giving alms and the tithe of bread. It is a salutary decree of this Order, counselled by piety, that, in all houses of this Order where there are churches or chapels, the tithe of all bread baked in the ovens of the houses be given to the poor, or that, instead of the tithe of bread, common alms be given three times a week. 15. Of fasting by the brethren. From the Sunday prior to St. Martin's Day until Christmas, and from the Sunday seven weeks before Easter until Easter Day, except Sundays, and furthermore on Twelfth Night, and the Eve of the Purification of Our Lady, St. Matthias Eve, Fridays from All Saints Day till Easter, and St. Mark's Day, unless it falls on a Sunday, and on the three days when the Cross is carried, and on Whitsun Eve, and on the Vigils of St. John the Baptist, and of St. Peter and St. Paul, and of St. James and of St. Lawrence, and on the Vigil of Our Lady in mid-August, on St. Bartholomew's Day, and on the eve of Our Lady when she was born, and on St. Matthew's, on St. Simon's and St. Jude's Day, on All Saint's Eve, on St. Andrew's, on St. Thomas's, and on all four Ember days, the brethren shall fast on Lenten fare unless infirmity or other necessity demand otherwise; and if the vigils fall on a Sunday, then they shall fast on Saturday instead. On Fridays, from Easter until All Saint's Day, the brethren may eat Lenten fare twice a day, unless, lest the laity be scandalized, the province commander with the better part of the chapter, counsels otherwise. 16. Of the evening drink. Every fast day the brethren shall have a collation; on other days, when they eat twice, they shall have none, unless by special permission from the superior. On collation days, the brethren, after Vespers, before Compline, shall assemble for collation and, giving thanks to God, shall take the drink which is offered them; and since in other orders where collation is drunk at night there is reading to which all listen in silence, we admonish the brethren to keep silent during collation, or to speak only of honest matters without gossiping. As soon as they hear the signal they shall go to Compline. 17. How and where the brethren shall sleep. All the healthy brethren, if it can be easily arranged, shall sleep together in one room, unless the superior orders that some brethren, because of official duties or because of same other matter, sleep elsewhere; and when they sleep, they shall sleep girt in their shirt, with drawers and hose on, as is proper for religious. They shall sleep apart only if it is absolutely necessary. In the places where the brethren usually sleep, the light shall be left on during the night. 18. How the brethren shall keep silence. After Compline, the brethren shall keep silence until Prime the next day is said, unless in the meantime they must speak with their servants or anyone else in performance of their official duties or in the care of their steeds or their arms or for other things they are commanded to do; for which tasks they shall choose the most suitable time and do them as quietly and quickly as possible. Yet exception is here made for emergencies such as thieves and fire; and whoever has to speak because of such matters shall recite a Pater Noster and an Ave Maria before going to sleep. 19. That no brother, save office-holders, have a seal. We decree also that no brother, save those to whom an office is entrusted, have a seal or send letters, or read letters sent by anyone to him, without the permission of the superior, before whom, if it so pleases him, the letter which is received or is to be sent, shall also be read. 20. How the brethren may be permitted to give, receive and exchange things. The brethren may exchange or give away without permission what they make of wood, save things which are entrusted to a brother for his use by the superior, and which he shall not exchange or give away without the master's permission; likewise no brother, except the commander, shall receive gifts for his own use without permission of the superior, who also has the power to decide whether he wishes to let the brother keep the gift or give it to someone else. 21. How they shall not have special keys. Since religious shall in all ways avoid property we will that the brethren who live in religious houses do without keys and locks for bags and boxes and chests and other things which can be locked. Here are excepted brethren who are travelling, or who are office holders, whose office requires such things for the common good of the house. 22. Of the things which pertain to the knights. 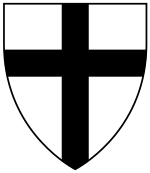 Since this order is specially founded for knights fighting the enemies of the Cross and of the faith, and since the customs of the enemy in fighting and in other matters differ in different lands, and therefore it is necessary likewise to oppose the enemy with different weapons in different ways, so we leave to the decision of the superior among the brethren the things which pertain to knights, horses, arms, attendants and other things proper and permitted to the brethren for battle, that he order and decide all the aforesaid things with the counsel of the wisest brethren of the province in which the war is fought, or with those who are present, if he cannot delay without harming the other brethren. However, the rule shall be carefully observed that saddles and bridles and shields be not painted needlessly with gold or silver, or other worldly colors. 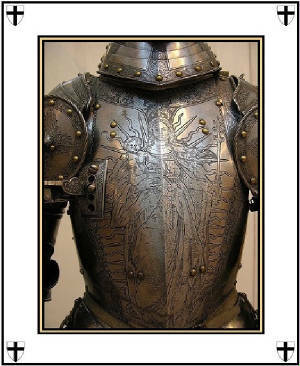 Spears, shields, and saddles shall not have covers, but polished lances may be covered with a sheath so that they be kept sharp for wounding the enemy. Likewise if the master or the brethren, who are empowered by the master, give or lend to other men beasts and arms or other things which were granted to the brethren temporarily for their use only, then the brethren to whom the things were granted, shall in no way object, so that there be no thought that they wish to keep as their own things which were granted only temporarily. Further we decree that no brother seek to have a weapon or animal as peculiarly his own. Should it happen that a brother was or is granted anything which is not fit for use, he shall humbly and decently inform the official who is in charge of that office about the deficiency and shall submit to his discretion to act and order the matter as he wills. The brethren shall not participate in the chase, as it is currently carried on with hallooing and hounds and hawking with lures. But if they have or acquire in the future in some regions thickly wooded lands from which they may gain great profit in game and skins, then they are allowed hunters whom, with others also, the brethren may accompany for defense and protection against evil men. However, they shall not go rushing over fields and through woods with arrows and other weapons on purpose after wild animals. Further we allow them to harry wolves, lynxes, bears and lions, without hounds, and to destroy them, not as a pastime but for the common good. Meanwhile, the brethren may also shoot birds to practice shooting and increase their skill. 24. How to care for the sick brethren. Since the sick are entitled to special attention and care, we will that pains be taken to entrust the care of the sick brethren to those who are provident and devoted, who with diligence faithfully attend to their every need and convenience and follow fully the physician's advice, if a physician can be conveniently secured. 25. Of the old and the infirm brethren. The old brethren and the infirm shall be generously cared for according to their infirmity; they shall be treated with patience and diligently honored; one shall not in any way be rigorous as to the bodily needs of those who bear themselves honorably and piously. 26. How the brethren shall live in friendship and brotherhood. All brethren shall behave to each other so that friendly concord in the name of brotherhood does not turn into hardness of heart, but they shall take pains to live with each other in brotherly love, harmoniously and amicably in the spirit of gentleness, so that one may justly say of them: how good and how pleasant it is for brethren to dwell together in unity, that is harmoniously. Let each, as well as he can, bear one another's burdens, and in accord with the Apostle's advice be diligent in honoring one another. No evil speech--whispering, backbiting, boasting of deeds of old, lying, cursing or reviling, quarreling, or idle words shall issue from a brother's mouth. But, if any of the brethren at times mistreat each other by word or deed, let them not delay to seek reconciliation and not be slow, each one to heal with instant words the wounds in the other's heart, where he has been injured by word or deed; as likewise the Apostle bids us that the sun not go down on our wrath, that is, that it not last overnight, and as especially our Lord Jesus Christ bids us in the Gospel, where he says: "If thou bring thine offering before the altar and there rememberest that thy brother hath aught against thee, leave there thy gift before the altar and go first to reconcile thyself with thy brother and then come and offer thy gift. 27. How all the brethren shall come together in council. The Master of this Order, or his deputies, shall call together all the brethren in residence whenever they wish to consider or decide about matters concerning the whole Order, whether to continue or to change and about the alienation of land or small pieces of real property, for which license must be secured from the Master and Chapter, and also about the reception of brethren into the Order; then, whatever the wiser part of the brethren shall decide after discussion, the Master or his deputies shall put into effect. Which is the wiser part in case of disagreement shall be left to the judgment of the master or his deputies; and, furthermore, piety, and discretion and knowledge and good repute shall have more weight than just a plurality of the brethren. Other smaller matters they may settle with the wisest brethren who are at hand. Some small matters they may decide themselves. Should it happen that some urgent business concerning the house and the Order has to be discussed after Compline rather than at another time it may be done, so long as idle words and words moving to laughter be avoided. Those present at this council shall likewise recite a Pater Noster and an Ave Maria before they go to sleep. 28. How the brethren shall set people a good example. Whenever the brethren are travelling or going against the enemy or on other business, since they display outwardly by the Cross the sign of meekness and of the Order, they shall strive to show people, by examples of good deeds and useful words, that God is with and within them. If they are on the road at night, they may, after Compline or before Prime, speak of necessary and honest matters, but not in the hospice after Compline has been said, except as prescribed above. They shall avoid inns and places they know are of bad repute; also, in their lodging there shall be in the room where they sleep a light by night, if they can arrange it without great difficulty, so that no harm may come to their good reputation or to their effects. While on the road travelling from place to place, they may attend divine service and prayers wherever they are, and on their return to the house they may, because of weariness from arms or the road, be excused in the morning from Matins and from the Hours; not only those wearied from a journey, but also those who are engaged in necessary business of the house may be excused. Weddings and gatherings of knights and other assemblages, and frivolous amusements, by which through worldly pride the devil is served, the brethren shall rarely attend, though they may attend for the affairs of the Order or to win souls. The brethren shall avoid talking in suspect places and at suspect times with women and, above all, with maidens, and kissing women, which is an open indication of unchastity and worldly love, so that it is forbidden likewise to kiss even their own mothers and sisters. No brother shall have dealings with excommunicated people, or those who are publicly put under the ban, in matters not specially permitted. Likewise, no brother shall become a godfather, except in mortal emergency. 29. Of the probation of those who wish to enter this Order. He who wishes to be received into this honorable brotherhood shall be given a suitable period of probation, so that he may learn the hardships to be undergone in this Order, and the brethren may find out his character, unless he wishes to be excused the period of probation, and his sponsor agrees, in which case he may then make profession of complete obedience. Then the superior, if he is present, or a priest, shall give him the mantle with the Cross, which is blessed with the usual blessing and asperged with holy water, for he receives the habit of this order with the Cross, and otherwise no other garment distinguishes the novice from the professed. 30. How children shall be received into the Order. We will likewise that no child be given the habit or received into this order before he has reached his fourteenth year. But should it happen that fathers or mothers or guardians bring a child to this order before his fourteenth year, or the child come of his own accord, he, if the brethren wish to receive him, shall be well brought up until the prescribed age, and then, if he and the brethren consent, he may be received into the order in the customary manner. 31. How women shall be received into the service of the house. Furthermore we decree that no women shall be admitted in full service and fellowship to this Order, for it often happens that manly courage is most harmfully softened by familiarity with women. And yet, since there are some services for the sick in the hospitals and also for the livestock which are better performed by women than by men, therefore, it is permitted to receive women as sister aids for such services. However, they shall be received only with the permission of the provincial commander, and, after they are received, they shall be housed apart from the quarters of the brethren, for the chastity of professed brethren, who dwell with women, although a light is kept on, still is not safe, and also may not last long without scandal. 32. How to receive those who are married as domestics of the house. Since this Order may have need of more people, we permit the reception, as domestics, into this Order, of lay people, married or single, who submit their bodies and property to the direction of the brethren; furthermore, their life, as is seemly, shall be honest, and they shall not only avoid manifest sin, but also shall not pursue illicit profit and trade. They shall wear garments of a religious hue, but not with the full cross. And if they are married and one dies, half of the estate of the deceased falls to the Order, but the other half to the survivor until his death; and after his death the entire estate falls to the use of the Order. In addition, whatever they acquire after reception into the Order shall all fall to the house. It is also decreed that, at the will and discretion of the provincial commander, some persons may be received on other terms, if he deems it useful. 33. How to receive those who serve for charity or for wages. If anyone wishes to serve the brethren for charity or for wages, since it is difficult to make a special rule how each shall be received, we decree that it be left to the discretion of the official in charge of receiving applicants at the particular time and place; and further that no brother beat any servant, who serves the house for charity or for wages, except the office holders, who, in order to correct their subordinates, may chastise them from time to time, as is customary. Whenever it happens that a knight or a man worthy of knighthood joins the brethren to serve in arms for charity and then dies, each brother present shall recite thirty Pater Nosters for his soul, and give to the poor for seven days such food as it is customary to give to one brother. 34. Of the Master's care for the brethren. In the ark were placed both the rod and the manna, which signify to us that for judges there should be both: the one mildly calling for mercy and the other justly calling for severity. Therefore, the master who is over all the others and shall, himself, give to all the brethren an example of good works, shall both reprove the turbulent and receive the sick, and shall comfort the downhearted and be gentle and patient to all, and shall carry in his hand the rod and the staff, according to the words of the prophet, the rod of watchfulness, with which, keeping nightly watch over his flock, he graciously frees the slothful from the deadly sleep of sloth and of neglect of the sacred observances, diligently and justly, chastises all disobedience; the staff shall be the fatherly care and compassion with which he shall support frailty and strengthen those who are faint of heart and broken by sorrow so that they, uncomforted, are not destroyed by despair. 35. How they shall admonish and accuse each other. Should it happen that a brother becomes aware of another brother's secret sins, he shall gently and in truly brotherly fashion persuade him to repent and confess his misdeed. But if he has done anything openly against the welfare of his own soul or the honor of the house that should not be ignored, let him be admonished to appear before the master and the brethren and humbly ask for forgiveness. But also, if it happens that he does not comply and is convicted with more witnesses before the master and the brethren, then it is just that he suffer so much the harsher penance. 36. How the brethren shall make amends for their misdeeds. If a brother by word or deed or otherwise commits a trifling offense, he may disclose it to his superior under whom he shall make voluntary amends. For a petty offense, a small penance shall be set, unless he repeat so often the petty offense that it is just to increase and extend the penance. Should it happen that an offense, which he wishes to conceal, is discovered by someone else, he shall justly be more heavily penalized. If the offense is great, he shall be separated from the society of the brethren and shall not eat with them at their table, but shall sit apart. He shall be wholly submissive to the will and the orders of the master and the brethren, so that he also may be saved at the last Day. 37. Of the heedful discretion of the master. The master has the power to dispense with all the above regulations laid down in the Rule, except for three--chastity, living without property, and obedience--and, with due regard to the time, the place, the person and the needs of the case, to give dispensations, but yet in such a way that in all instances he act to the honor of God with due regard to piety and practical considerations.